Hotel is a 5 min stroll from the strip so ideal place to stay, very clean, food is great, huge servings. The hotel owner Nicos is so welcoming, very funny & really helpful, we highly recommend & plan on going here every year as we love it. The 1st & 2nd floor apartments are best to stay in, not good views but people can see in your window if you’re on ground floor as pool is like 3/4 meters away. There’s a Greek night once a week but other than that there is no entertainment. 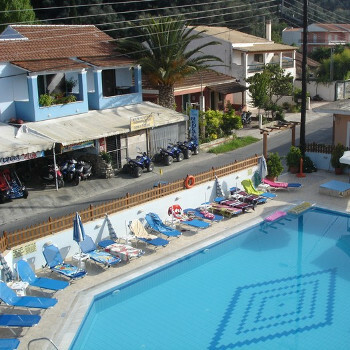 just returned from christakis i found the appartments in an ideal location 10 mins walk to the night life and very peacefull by day and night the rooms were very clean and all looking on to the pool .the food was basic but nice' nicko's who runs the place was a great bloke very funny and helpfull ..